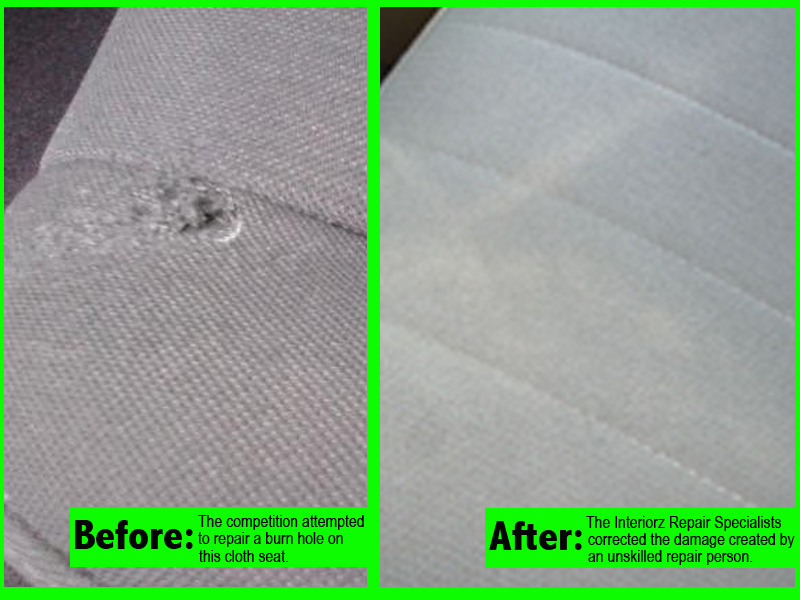 Automotive upholstery repairs are significantly less expensive than replacement. Interiorz, a division of Ultragloss, specializes in interior vehicle repairs. Damage to upholstery such as burn holes, rips or tears can be repaired in as little as one day. We see the inside of our vehicles a lot, those annoying rips and tears can grow quite annoying. Our interior repair services are affordable. A burn hole in your upholstery are typically repaired for about $40. These services are especially helpful for lease turn-ins. We can save you a lot of money on all your repairs before your turn your vehicle in. We’ve saved our customers thousands on their lease turn ins. We even fix the work of the competition on upholstery. See more before and afters here.